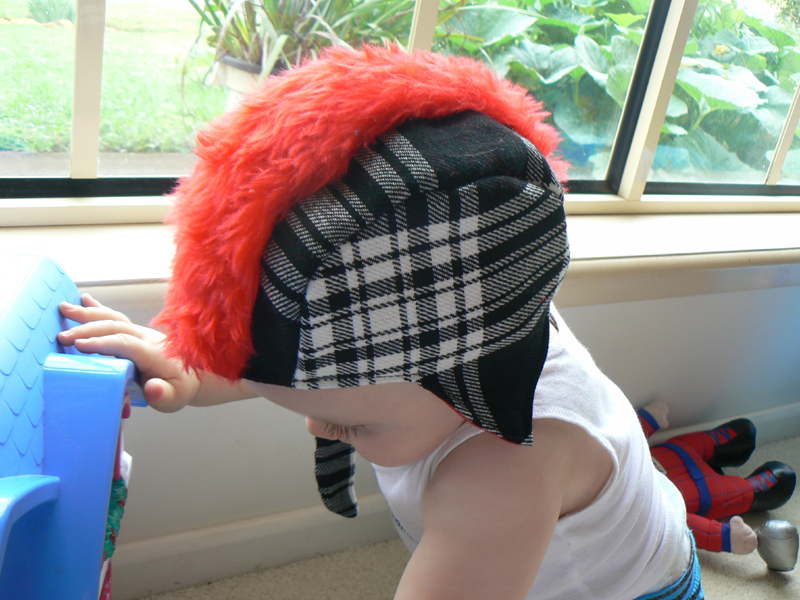 So I made this adorable little tartan helmet thing for Vin for when it gets cold out. It's made out of op-shop-bought black wool tartan and lined in red broadcloth. Oh, did you notice the BRIGHT RED MOHAWK down the middle? That's pretty cool too isn't it! I'm going to buy longer faux fur, so it will stick up higher. That's right. This is the only decent shot I could get of the front. I still haven't put a snap on the chinstrap yet, so he pulls it off every second he can get. That's why his hands are full of things :D Yep. Clever mummy. oh this is so cute, I would even wear a hat like that! 1 - I am scared of the dark. If Corey isn't around I have to sleep with a light on. 2 - I also have a random taste in music. My cd collection ranges from country to hip hop to old school rock to pop. I love it! 3 - I am at uni about to graduate but I am still not sure if I really want to do this with my life. What I really want to be is a mother! I would be content to stay home with my kids all day. 4 - I am allergic to chocolate and coconut. Okay so I only got 4 but I can't think of anymore at the moment. Hee hee! Looove the mohawk hat thingy. That hat is too precious! I made mohawk hats for the men in my life not that long ago but they were much, much different. Hmm... I really need to posts pics of those. 1. I cannot eat a food that is that pale artificial blue color. Just the thought of it makes me squeamish. It reminds me of Smurfs. 2. I got a degree in art because I knew I'd end up working in an office somewhere for a living but knew that a degree would be beneficial so I studied something I had/have a passion for. 5. I rarely wear socks but when I do, chances are they are not going match. And it's not by accident. First of all, I love your work...I saw your stuff on Craftster and saw that you have a blog on blogspot so I had to check it out. ooo can I do the 7 random things too? 6. I'm a mommy to a beautiful 15 month old daughter. She's just too cool for school. 5. I hate plastic with a passion...It drives me nuts when my neighbors don't recycle. 4. I have tattoos on my arms and legs...my first tattoos being on my calves. Crazy me! 3. I live in conflict between wanting to be in nature and wanting to live in the city. My house has zero green space. In fact I think it has negative green space. No soil and not even enough sun to keep a plant alive! 2. I have a love hate relationship with cleaning. 1. I love to go bike riding! I just bought a trailer to bring my daughter around with me and enjoy the ride. Weee! That was fun. Thanks for letting me post randomness on your blog!